They say home is where the heart is, and it takes serious heart to sculpt the healthy body you desire. Good thing you've got what it takes for the rigorous strength-building, cardiovascular workout the durable, affordable Stamina® Air Rower provides. Though Stamina's wind-resistance design allows pricing that protects your budget, this air rowing machine effectively targets all major muscle groups to strengthen & tone your arms, legs, abs and glutes. 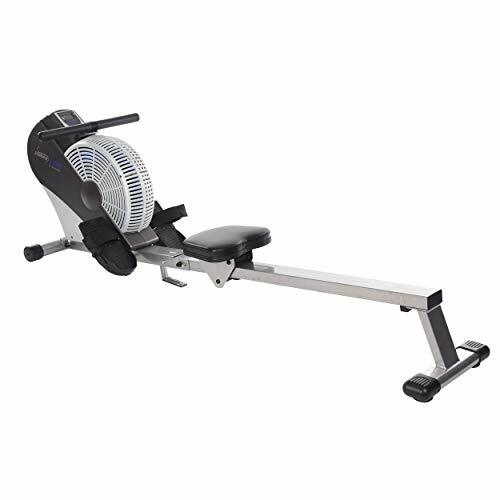 Engineered to ensure a smooth, comfortable rowing workout at home, this Stamina indoor rowing machine simultaneously works the upper and lower body with every stroke. The intensity of your workout is up to you, and adjusting the resistance level is easy: Simply change the speed of your rowing stroke. As you row faster or harder, the machine will follow your lead and amp up the level of resistance. For less resistance, just slow down. With intuitive resistance responses, you're left to focus on your workout. The Stamina® Air Rower is built with an oversized seat rail that solidly supports the smooth-sliding seat-made to accommodate your body type, whatever it may be. Because the home rowing machine is intended to help reach your fitness goals sooner than later, it's made with a padded, upholstered seat that's comfortable even during longer rowing routines. Textured grips and oversized foot plates add to your comfort and keep your hands & feet stable throughout the catch, drive, finish, and recovery phases of rowing. Why do so many fitness trainers recommend using a rower? Rowing is one of the best exercises for building a strong back while also pushing your heart rate to levels that actually increase your metabolism, burning calories and fat more efficiently. Because rowing is proven to provide a nearly unsurpassed aerobic workout without the relentless pounding to your joints, the Stamina® Air Rower lets you quickly improve your fitness while drastically reducing injury risks. EFFECTIVE CARDIOVASCULAR EXERCISE: Rowing on the Stamina ATS Air Rower 1399 helps burn calories, build total body strength and improve your hearth health. DYNAMIC AIR RESISTANCE: One of the main benefits of air resistance is that it always matches your pace. Row harder if you desire more resistance and ease off if you want less. LCD WORKOUT MONITOR: During your routine, track speed, distance, time and calories burned with the large, easy-to-read LCD display. UPGRADED FEATURES: The upholstered, padded seat, adjustable footplates and padded rowing handle help keep you relaxed during your workouts. Built-in wheels and a folding frame make storage a breeze. EASY ASSEMBLY: Once assembled, the rower is 77" long x 18" wide x 22" tall. Comes with three-year frame warranty and 90-day parts warranty.